What is Wood Lap Siding? 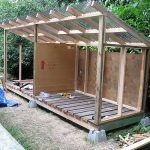 Before we can get into plywood and its uses for siding, we first need to know exactly how it will be used. So, what is lap siding? This term refers to siding that is installed onto the side of your house horizontally along each exterior wall. 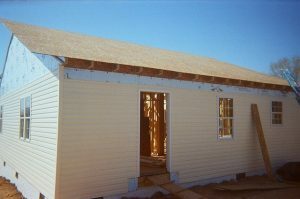 These planks of siding are arranged in such a way that they overlap each other at the upper and lower edges, hence the term “lap siding”. There are many different version of this siding style, including Dutch lap siding and cedar lap siding. Two of the most common styles also include beaded siding and the more traditional clapboard siding. All of these styles have one thing in common: they are installed horizontally on your house. Though there are other similarities, there are variations in the sizes and shapes of the materials used. Clapboard, in our modern language, means long and thin boards that are used I order to cover walls. Clapboard siding is also commonly known as clabbard siding, bevel siding, weatherboard, and even just lap siding. Now each one of these can be different, with the differences mainly depending on the climate where the building is located. Most people find that Dutch Lap siding offers an aesthetically pleasing appearance. Its look is handcrafted in a fine, old-fashioned way. It definitely lends itself to an elegant quality. If you want to give your home an old world look, then Dutch lap siding is for you. The curb appeal is definitely impressive. Back in the day, colonists actually had to hand carve groves in each and every board in order to achieve the same effect. This is time-consuming and as a result, Dutch Lap siding can be more expensive than some other varieties. If you like the look of Dutch Lap siding but want something more budget-friendly, you’ll find that certain varieties of vinyl siding offer a similar appearance at a lower cost. This is one of the most commonly used siding types used in the United States today. This type of siding is manufactured by re-sawing pieces of lumber at angles in order to make pieces that with a thick edge and a thin edge. Consumers typically have the option of choosing between pieces that have a smooth face on one side and a more rustic-looking “sawblade” texture on the other, or both faces with the same texture. Most of us know that plywood offers a wide variety of uses. It’s good for everything from making furniture to serving as an underlayment when installing siding. Let’s take a closer look at what plywood is, as well as what types of wood go into making plywood. When you look at plywood, it typically has one side that is smoother than the other. In nearly all instances, you want the smooth side facing outward. The other side is what is referred to as the “unfinished” side. This is done because that side will not typically be seen. Depending on grade, the face side will typically have far fewer blemishes than the unfinished or “back” side. Some types of plywood are specifically designed to hold screws, hinges, and other fasteners securely. There is also specially designed plywood that is specifically used in outdoor or harsh weather conditions. Most of the time, this plywood is designated as “exterior grade” or “pressure treated” plywood. The surfaces or front and back faces of the material typically dictate the grades of plywood. You can typically find plywood smooth on one side and rough on the other or smooth on both sides. Some are even designed with a foam rubber core in order to help insulate your home, reducing energy costs. A is the best grade to have for a front plywood surface in applications where appearance matters, while D is the worst score the front surface can get. The back is scored using numbers, where 1 is the best it can be and 4 is the lowest quality acceptable. So, for example, the best plywood you could get would be A1, but A4 would be the best it could be on the front and the worst it could be on the back. It is important to keep in mind that the back can often have discoloration and other defects. As you might have guessed, higher-grade plywood typically comes at a higher price than lower-grade plywood. If you want plywood to able to stand up to the sun, rain, snow, wind, and humidity, then you are going to want to check into pressure-treated plywood. Now, it is important to know that not all plywood labeled for outdoor use aren’t always pressure treated. Pressure treated plywood has chemicals added to it that make it more resistant to insects and mold. This means that pressure treated plywood is more likely to stand the test of time, at least as compared to the non-treated counterparts. There are times that you want to use a layer of plywood as an extra layer of insulation. CDX is an example of a type of plywood that you would use in that instance. Remember the grading scale we talked about previously? That is where CD in CDX comes from. The X indicates that there has been a glue used on it that is good for outdoor use. It is also great for indoor use, as long is it gets covered in some other material. This is definitely a great option if you are looking to save money and get the project done quickly. ABX is typically the highest-grade version of this product that you can find. Now, it is important to remember that different chemicals have been added to this plywood. As a result, not all nails and fasteners are approved to be used with it. You will need to ensure that you select compatible fasteners when indicated by the manufacturer. For example, some types of pressure-treated plywood are designed to work with stainless steel or galvanized hardware. It’s a good idea to ask the seller for clarification if you’re not sure which nails, screws, or staples are best for the plywood in question. There are a few important things that you need to remember before you start your siding project. Because plywood used for siding purposes is typically treated with chemicals, it’s important to take some simple precautions. There are a few different concerns that you’ll want to address before you begin. First, you need to be mindful of dust. Inhaling dust from treated plywood can be detrimental to your health, so make sure that you wear appropriate protective equipment. At a bare minimum, you should wear a dust mask when cutting plywood. Safety glasses are always recommended when cutting, as they’ll keep dust and debris out of your eyes. Try to keep the dust out of living areas, and have your helpers wear protective equipment as well. As you now know, there are many varieties of plywood to choose from. There are also many different sizes of plywood to consider, as well. And that doesn’t just mean the length and the width. Most plywood comes in 4 foot by 8-foot sheets. Depending on the type and the recommended applications, you can also commonly find them in 10 foot by 12-foot sheets. Some types of plywood are available in even smaller 2-foot by 4-foot sheets. The thickness of the plywood is often determined by its ply count. The typical thickness of plywood is either ¾-inch, ½-inch or ¼-inch. It is important to know that when you purchase your plywood, it is not uncommon for it to be around 1/32 inches thinner than advertised. This is called a nominal thickness. Nominal thickness isn’t going to be much of a concern for your siding project. If you don’t account for this on other projects such as cabinetry or furniture building, however, it can cause your fits to be looser or tighter then anticipated. Be sure to measure carefully whenever you work on a project in which precision counts! The most common types of wood used in plywood for siding are maple, birch, mahogany, oak, douglas fir, pine, and spruce. Certain types are more common than others, depending on climate and what’s traditionally most popular in your region. My go-to choice for siding is LP SmartSide. These panels offer the same wonderful aesthetic of traditional natural wood but come with the durability of treated and engineered wood. This is a high-performance product with the ability to complement nearly any building style. All of the LP SmartSide products go through a four-part SmartGuard manufacturing process. This process helps to provide the products with strength and resistance against fungal decay, termites, and harsh weather. That means that this is a great option if you are looking to upgrade your home’s aesthetic appeal. It’s possible to get creative when working with this product. One great option is to accent homes that are partially finished in stone with LP SmartSide. It definitely provides a wonderful contrast that any homeowner can appreciate. There is a rich cedar grain texture option available, as well as a nice smooth finish. You can limit the number of seams in your project by getting the longer lengths, as well. These also provide for a great, consistent look, making for excellent curb appeal. More specifically, the LP SmartSide Trim & Siding that you would get for your siding project is treated with their proprietary process, which ensures durability. In fact, it is one of the most durable options on the market today. This lap siding is able to resist and reduce damage from hail and other forms of impact damage much better than vinyl and cement competitors. This, along with its resistance to inclement weather and insects, makes for a really robust option. There are some other benefits to choosing this option, as well. For one thing, you can work it and cut it just like regular wood. Using the SmartSide trim and siding also requires fewer tools then its fiber cement siding counterparts. It also weighs less, is more resistant to breakage then fiber cement, it weighs less and is easier to carry than other variants. Whatever lap siding style you prefer, you’re likely to find that specialty products such as LP SmartSide plywood are ideal for your siding needs.